Libero tracker is also referred to as the assistant scorer. First identify each teams designated liberos. Record all libero replacements and team substitutions. Confirm that all libero replacements are made correctly. This is the libero number listed in the first box of the set one line up sheet. This is the libero on the court during play. The second libero is the libero not on the court. As an assistant scorer/libero tracker, it's important to understand libero rules in order to perform your duties. Each team has the option to designate one or two Liberos at the beginning of the match. The liberos are designated on the line up sheet. Liberos are designated for the MATCH. The liberos designated on the line up sheet are the only two liberos that may play for that team for that match. One libero will be designated the Starting Libero on the line up sheet. This libero will be marked in the L box on the Libero Control Sheet. 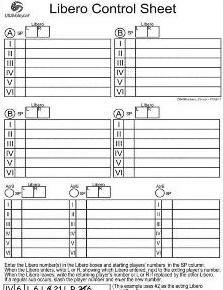 If there is a second libero, this libero will be the second libero and will be marked in the R box on the sheet. Only one libero per team may be on the court at any time. 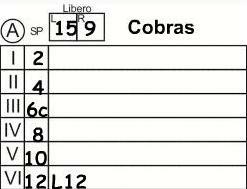 On the line up sheets, you can see Cobras has 15 designated at the starting libero. Number 9 is the second libero. 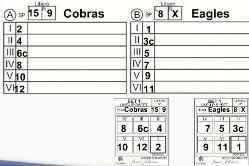 Eagles have only one libero, with an X marking the second box. If you have a team that doesn't fill in the second box, make sure to have the second referee check with the team to see if they want a second libero. When it's determined the team doesn't want a second libero, place an X in the second box if one isn't already there. Enter the team names next to the Libero boxes. Enter the liberos into the appropriate boxes. Enter the starting line up into the appropriate places. Enter numbers into matching boxes. I goes in I, II goes in II, etc. The player that has a C next to their number is the playing or floor captain. If the playing captain leaves the game, you or the scorer needs to be sure that the referee asks the team who the new playing captain will be. After the second referee has checked both team line ups before the start of the set, the libero may enter the court replacing one of the back row players. The libero tracker needs to track the liberos on both teams. The libero that first enters the court must be the starting libero. In this case, #15 replaces #12. Write an L next to 12. Do not slash the L or #12. When the libero exits the court, either the Second Libero or the player whose number is before the L must replace the Acting Libero. In this example, the libero is replaced by #12. Remember, the libero must sit out one completed rally before entering the set. This means that neither libero can enter the set until a completed rally occurs. Part of your duties as a libero tracker is to make sure the libero doesn't play the front row or is allowed to serve. If the libero rotates to the front row and doesn't get replaced, at the moment of contact of serve notify the second referee that the libero is a front row player. If the libero serves the ball, notify the second referee that this has occurred. The second referee will stop play in both of these instances.